When I made hamburgers a couple weeks ago, I was scrambling at the last minute, trying to come up with something to serve as a side. It's been hot and I've been trying to cook as little as possible in the kitchen, so oven fries were out of the question. However, I had some potatoes that had to be used, so I started brainstorming and decided to experiment a little bit. I'm glad I did, because the results were actually quite tasty! I had never heard of grilling sliced potatoes, but I figured I'd give it a try anyway! Slice potatoes lengthwise into thin slices. Drizzle with oil and rub to cover both sides of the potatoes. Season with salt, pepper, garlic powder, paprika, and just a tiny bit of cayenne to taste. Place potatoes directly onto a preheated grill over medium heat. Grill until the first side is golden brown and crispy; then flip and grill until the potatoes are crispy and cooked through. Jerry's zucchini is coming in!! For those of you who don't know who I'm talking about, my neighbor Jerry always provides us with some amazing produce every summer. Last week he brought us a bagful of fresh zucchini, so I quickly went to work making some dark chocolate zucchini brownies and zucchini fettuccine Alfredo. It was a yummy night! First batch of the summer! If I weren't serving kids, I probably would have omitted the fettuccine and just made zucchini Alfredo. But I knew that wouldn't go over well with the little ones. The goal was to have fettuccine noodles and zucchini noodles, but I got distracted while cooking and ended up with zucchini pieces mixed in with noodles. It really doesn't take long to cook the zucchini. For the sauce, I started with a recipe I got from Christina, one of the ladies at church. She's the source of the original Caesar salad dressing that I altered to make my own. I also altered the Alfredo recipe to accommodate my family of six. You will notice that most of the sauce ingredients are high in fat. This is definitely one of those special-occasion recipes. And of course, you could always add chicken for some protein. Boil fettuccine according to package directions. 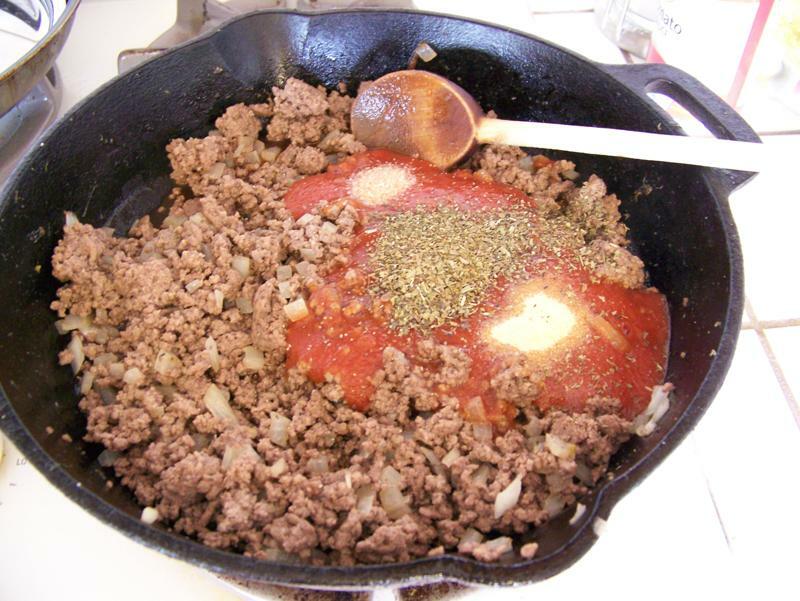 Meanwhile, melt butter in large skillet (large enough for sauce and pasta) over medium to medium-high heat. Add cream and 3/4 tsp. salt. Bring to simmer and continue to cook about five minutes, being careful not to let it boil. With this much butter, you know it's going to be good! And then comes the cream! During the last one to two minutes that the pasta is cooking, add zucchini. 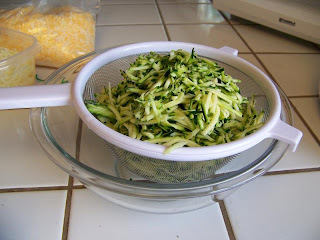 Drain fettuccine and zucchini ; toss into skillet with sauce. Add Parmesan and salt and pepper to taste; toss. Serve immediately. With a side of crusty bread, of course. Last March, I posted a delicious chocolate chip cookie recipe. And while it is delicious, we've been able to improve upon it just a little bit based on some recommendations by one of Sumiko's friends from church, along with some of our own experience. The recipe is almost exactly the same, but the technique has changed a bit. In a medium mixing bowl, combine flour, baking soda, and salt. Set aside. In a large mixing bowl (I use my KitchenAid mixer, but you can also use a hand mixer), cream butter until pale yellow and shiny. Add shortening and beat until combined. Add sugar; mix until well-combined. Add brown sugar and mix well. holds its shape once you take it out of the measuring cup. After the sugars have been mixed into the butter. Add vanilla and egg; mix well. Add the flour mixture all at once, mixing until almost (but not completely) combined. Add chocolate chips; mix just until they're evenly distributed and the flour has been incorporated. Do not overmix. I like cookies to be thick, so I've found that in order to get thick, chewy cookies, you first of all, need to make sure the butter isn't too soft. The second thing is to scoop the cookie dough balls and then freeze or refrigerate them for at least several hours (see tips for freezing below). I usually make the dough at least a day ahead. Bake straight out of the refrigerator or freezer for 10-12 minutes, or until cookies are light brown. Cool 1 to 2 minutes before transferring to a wire rack to cool completely. This is when you want to add the chocolate chips. In this batch, I used half chocolate chips and half M&Ms. Scoop the dough into balls. Place dough balls on a cookie sheet and freeze for 15-20 minutes or until dough balls begin to harden. Place dough balls in a zip-top bag and freeze. When you're ready for some fresh cookies, simply pull the desired amount of dough balls out of the freezer and place them on your cookie sheet. You can bake them frozen, but add a little time to the bake time. You can also freeze baked cookies. Simply bake as instructed, wrap cookies or place in zip-top bag and freeze. My apologies for this late and unoriginal post. Robbie and I have been sick since last weekend and this bug just won't go away. Consequently, new posts are not on the top of my priority list right now. 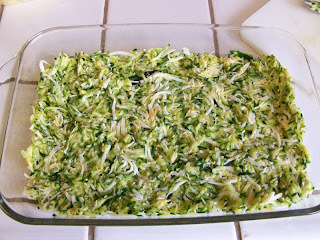 I thought I'd bring back one of my past zucchini recipes, since zucchini is coming in here. 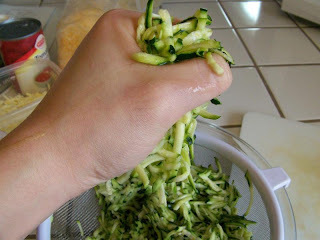 This is a great way to get your kids to eat zucchini and use up the abundance of your garden. I have a bunch of great posts waiting in the wings---hopefully I'll be able to get them finished up for next week. 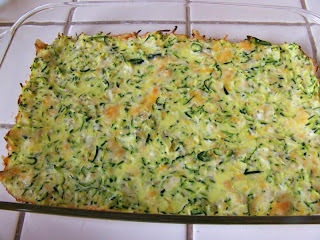 I was browsing through our Near to Nothing Great Grandmother’s cookbook a couple weeks ago when I found this recipe for zucchini pizza casserole. 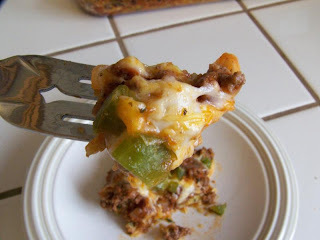 Since zucchini and ground beef were on sale, I just had to try it! The results? Delicious! Keanna, who normally doesn’t eat anything with zucchini in it, asked for seconds! One great thing about this recipe is that it is gluten-free. For those of you who do not normally cook GF, a few words of caution if you are serving this to someone with gluten allergies. Though you would not suspect it, gluten can be hiding in ingredients that you would think are GF. For example, pre-shredded cheese is often coated with flour or other floury powder to keep it from sticking. Simply buy cheese in a block and shred it yourself to ensure that it is GF. Also, be sure the sauce you choose is GF. 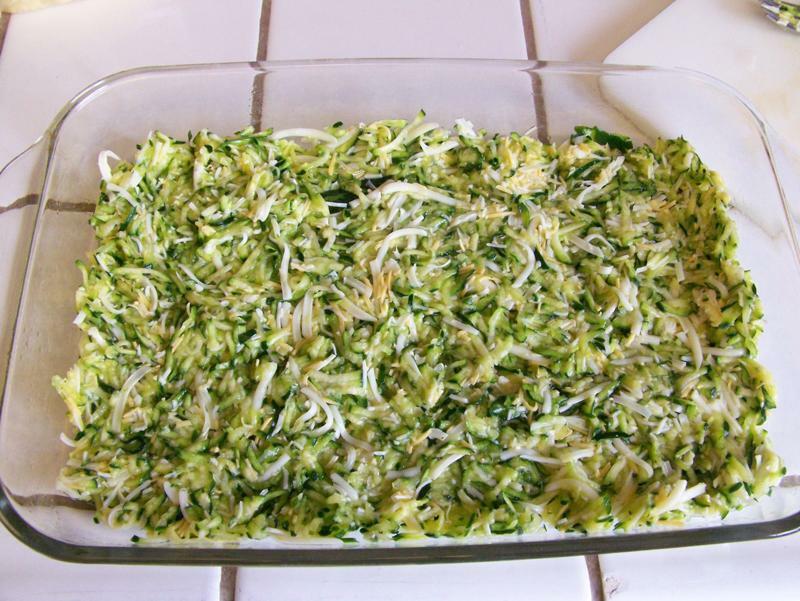 If you are wary of trying to pass off zucchini on your family, you could probably substitute shredded potatoes for the zucchini. I haven’t actually tried this yet, but it seems like it would work. In that case, you probably wouldn’t need to squeeze the liquids out, but you would still want to add the salt for flavor. Preheat oven to 400°. 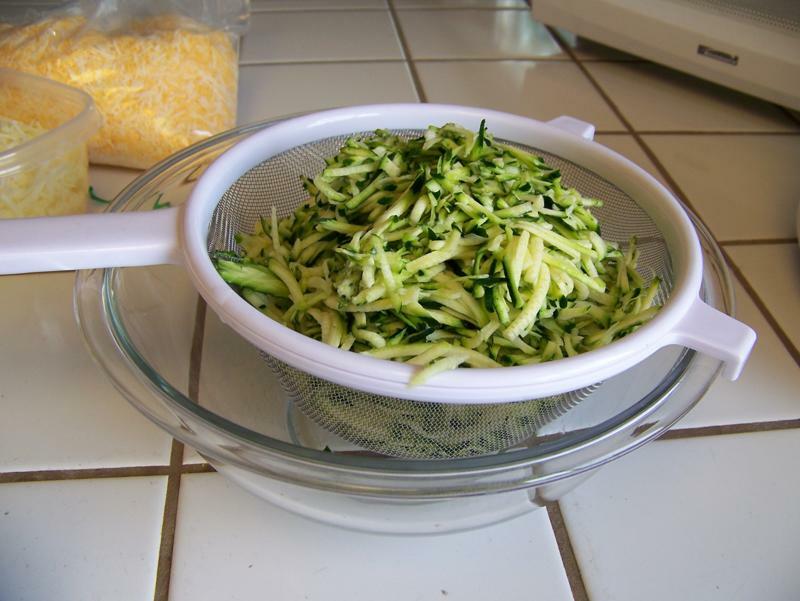 Place zucchini in strainer over bowl; sprinkle with salt. Let stand 10 minutes. Meanwhile, break up eggs in medium bowl. 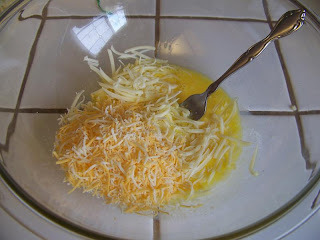 Mix in Parmesan cheese, 1 c. mozzarella cheese, and ½ c. cheddar cheese. 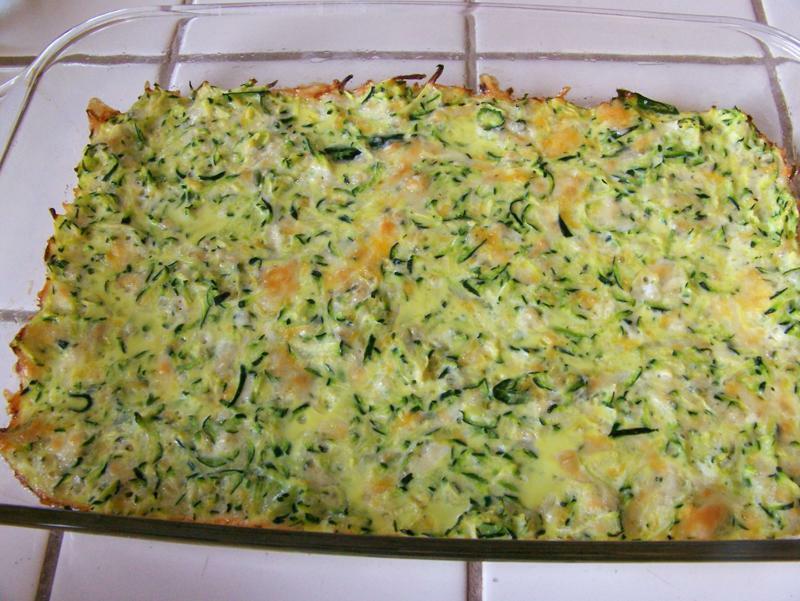 Squeeze moisture out of zucchini; mix into egg and cheese mixture. Press into greased 9”X13” baking dish. Bake 20 minutes. 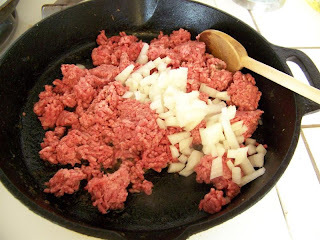 Meanwhile, brown ground beef and onions. 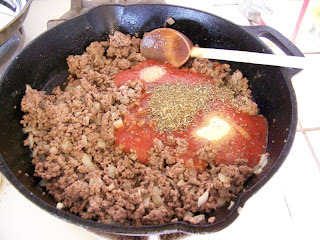 Drain off grease; stir in sauce (and seasonings if needed). Spoon over baked zucchini mixture. Top with remaining cheeses and sprinkle with green pepper. Bake an additional 20 minutes. I made a dessert for Easter that was topped with ganache made with a combination of chocolate chips and peanut butter chips. Brilliant! Why didn't I think of that?! Ganache, in and of itself, is so delicious, but then add peanut butter and you've got something that is out-of-this-world delicious! I had recently made cupcakes for my husband to take to work and wanted to top them with whipped ganache. But then I thought, why settle for that when I can top them with peanut butter ganache? The cupcakes were chocolate and peanut butter anyway, so it fit perfectly. The problem was that I didn't have any peanut butter chips and, to be honest, I really don't ever buy them, because they're expensive. So I decided to experiment a little bit and used peanut butter instead of peanut butter chips, and it worked! Now, I will say that it didn't have a super strong peanut butter flavor, but it was definitely there nonetheless. In a medium bowl, add chocolate chips and peanut butter. Warm the cream in the microwave to a simmer. Pour warm cream over chocolate chips and stir until the chocolate chips and peanut butter have melted and the mixture is smooth. I somehow neglected to realize that my chocolate chips had just come out of the refrigerator and wouldn't melt, so I just threw the mixture into the microwave for a few seconds. If your chocolate isn't melting all the way, you can do the same. (Sumiko mentioned that she also microwaves the chocolate chips (and peanut butter) a little bit before adding the cream.) At this point, you can either pour it over a cake as a glaze, or you can let it cool a while and spread it as frosting. You can also wait until it's completely cool and then whip it with a mixer. The ganache can be used as a frosting or a filling. 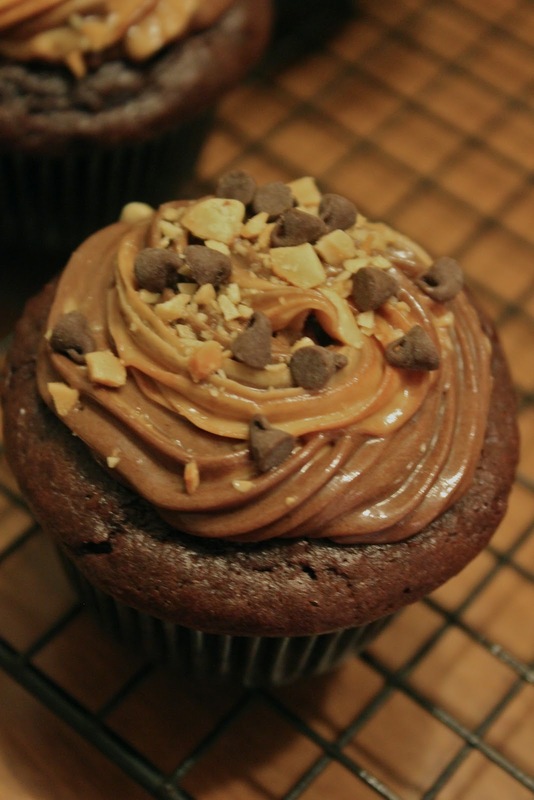 Whipped ganache, swirled with peanut butter filling. Sorry for the poor picture quality. You know those dishes that just have to be made like mom makes them? For me it’s chicken with the white sauce—I’ll have to post that one sometime. But for Robbie, it’s cornbread. When Robbie was a boy, his little brother was allergic to milk, so their mom would use orange juice instead of milk in her cornbread. The result is a super sweet cornbread that has turned Robbie into a picky cornbread eater. When we first got married, I started making cornbread with her alterations to my old go-to recipe—orange juice instead of milk and a little vanilla. It always tasted amazing, but the texture was never quite right. I figured it was because the OJ throws off the acid/base balance. A little tinkering, and I’ve finally perfected it! One key to any cornbread is to not over mix it. There is a huge temptation to mix the wet and dry ingredients together until the batter is smooth—DON’T DO IT!! The batter should still have lumps in it when it goes in the pan. This concept may deserve a separate post. To make this completely dairy-free, I' sure you could replace the butter with melted shortening or vegetable oil (though I've never tried it). Preheat oven to 350°. 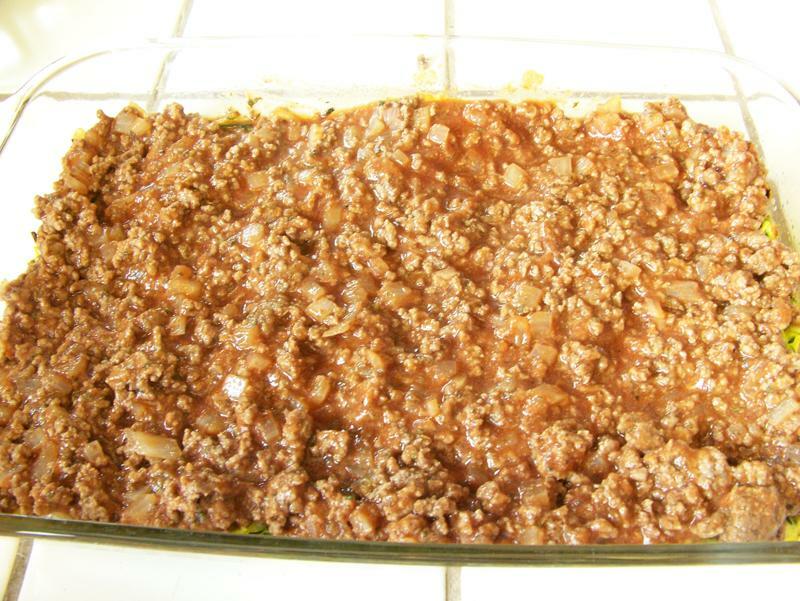 Grease 8- or 9-inch square baking pan; set aside. In medium bowl, combine flour, sugar, corn meal, baking powder, and salt. In a small bowl, beat eggs to break up. 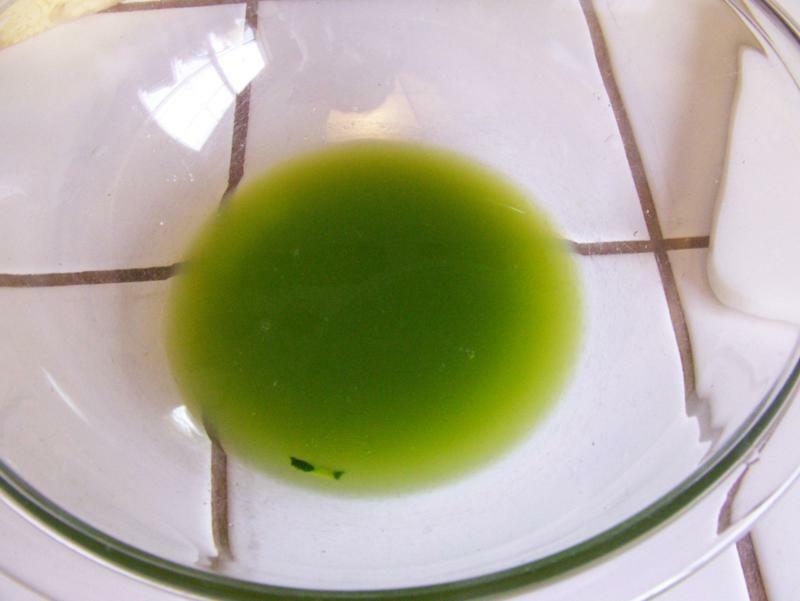 Stir in orange juice, vegetable oil, butter, and vanilla. 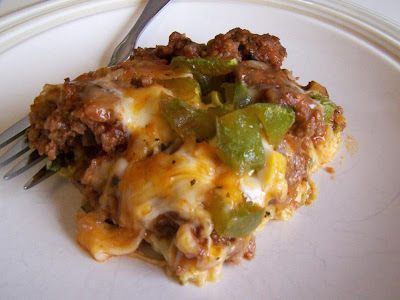 you don't end up with chunks of egg in your cornbread. the eggs if it is still hot from being melted. Add to flour mixture; stir just until blended. Do not over mix—there will still be lumps. Pour into prepared pan. Bake about 35 minutes or until toothpick inserted in center comes out clean. Cornbread muffins: Grease or paper-line muffin cups. 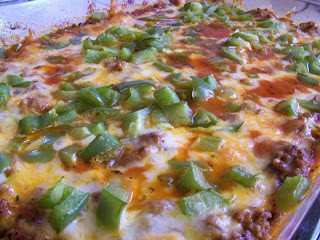 Fill ⅔-full; bake 18-20 minutes. Cool in pan 5 minutes before removing. As a bonus, you’ll notice that all my pics are of a funky 9”X13”-turned-into-a-9”X9” pan. I used this technique twice in the same week so I thought it was worth sharing. If you don’t have the right size pan, simply use a larger pan and make a foil dam to get the proper size. Heavy duty foil is best, but regular will suffice (that's what I used). Be sure to fill the empty part with some water to avoid overheating and burning that side (like filling the unused spaces in a cupcake pan). Just be sure not to puncture the foil or let it spill over--no soggy cornbread! is as high as the pan walls. My husband loves hamburgers. I've managed to get him to eat (and even enjoy) turkey burgers, but he still prefers burgers made from beef. Sadly for him, I haven't bought beef (of any kind) for quite some time, due to the price. However, I checked for clearance meat when I was at the grocery store this week and low-and-behold, there was 90% lean ground sirloin on clearance for 50% off. The original price was over $7/lb, but they were on sale for $3.70-something/lb. Pair that with the 50% clearance discount and it's a great deal! When I told him we were having burgers, he was so thrilled that they were beef! Place bread in a bowl. Pour just enough milk over it to saturate the bread, but not more than the bread can absorb. Let sit for 10 minutes. You want your bread to be nice and soggy so you don't end up with chunks of bread in your burgers! Preheat grill to medium-high or high heat. In a large bowl, combine beef, soggy bread, yolk, worcestershire, cayenne, 1/2 tsp garlic powder, and salt and pepper to taste. Mix well. The best way to mix it is with your hands! Just be sure to wash your hands really well with warm/hot water and soap before touching anything else! Form into 4 patties. When forming patties, make them a bit larger (in diameter) than want them to end up. They will shrink when they're cooked. Also, make them thinner in the center than around the edges. Sprinkle each side of all burgers with salt, freshly ground black pepper, and garlic powder. Grill for approximately 5 minutes per side, or until burgers are cooked through. If you want a cheeseburger, add cheese during last couple minutes of grilling. For an extra yummy burger, slice onions into discs (don't separate the rings). Drizzle with vegetable oil and place on grill with burgers (but don't place the onions directly over the heat). Instead of using raw onions on burgers, use the grilled ones!